Italy's return to political instability is a stark reminder for investors that Europe faces a long uphill battle to emerge from its economic crisis. European shares, the euro and Italian government bonds all sold off Monday after Prime Minister Mario Monti said he would resign later this month. 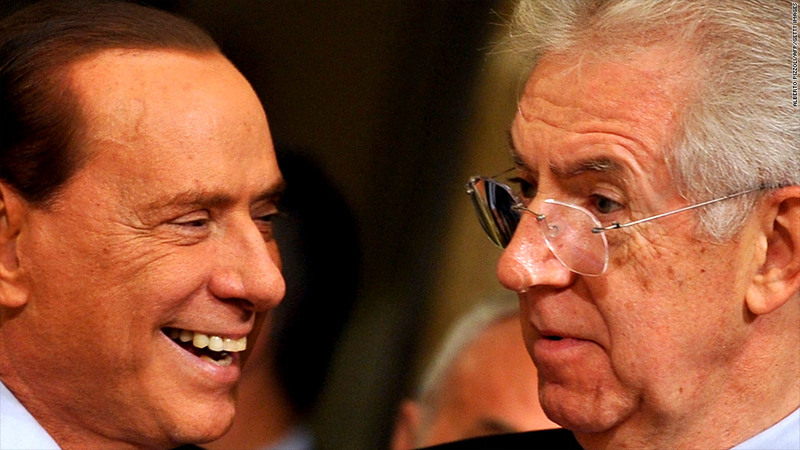 The announcement follows the withdrawal of support for Monti's technocrat government by former premier Silvio Berlusconi and his People of Freedom party, which ended an uneasy political truce. Spanish bonds also suffered as investors sought to reduce their exposure to other heavily-indebted eurozone countries. Monti, a former European Commissioner, has been credited with restoring confidence in Italy, as well as with its eurozone partners and investors, thanks to his commitment to reduce government borrowing and introduce economic and political reforms. While yields on 10-year Italian government bonds have risen to nearly 5% from 4.5% over the past week, they remain way below the 7% level Monti inherited a year ago, when he succeeded scandal-ridden Berlusconi, who resigned under pressure for failing to reign in borrowing. "These latest political developments should remind investors that there is currently not much political stability in Italy, and its bond market should reflect this," Nomura economists said in a research note. Italy has also benefited this year from the European Central Bank's announcement that it is prepared to buy bonds of ailing nations, provided they sign up for a formal bailout -- a move Monti has insisted the eurozone's third-biggest economy does not need. Monti's technocrat government, which until last week was backed by a broad coalition of Italian political parties, has raised taxes, cut spending and introduced reforms in a bid to control Italy's soaring debt, which stands at some 130% of gross domestic product. Fiscal tightening, weak confidence and tight credit supply have kept Italy deep in recession for the past five quarters. The economy is expected to shrink by about 2.4% this year, and continue to contract in 2013. Unemployment hit 11% in October and is forecast to rise even further next year. The OECD and some private forecasters believe Monti's fiscal targets are overly optimistic, and that further austerity measures will be needed in 2014 to wipe out the structural budget deficit. Political instability may also delay the implementation of product and labor market reforms, making a return to growth harder. Berlusconi's announcement last week suggests he will use the campaign to launch a populist attack on Monti's record, austerity, and Europe. "All this will hardly appease financial markets," noted UBS economist Matteo Cominetta. "Investors should therefore prepare for a volatile couple of months in the run up to the elections." BNP Paribas' co-head of European economics Luigi Speranza said investors have been underestimating the risk of an intense debate leading up to Italy's elections early next year, but that the outcome would ultimately be positive. Others analysts agree that recent events have changed little for Italy's longer term outlook, with opinion polls pointing to victory for a centre-left coalition broadly supportive of Monti's plans. But the instability could complicate further efforts to push forward reform at a European level. Finance ministers, then heads of state, meet later this week to try to hammer out details of a common system of banking supervision in the eurozone, seen as a critical first step to stop failing banks tipping member states into insolvency. Monti, a strong advocate of European integration, will be a less influential voice at the table. 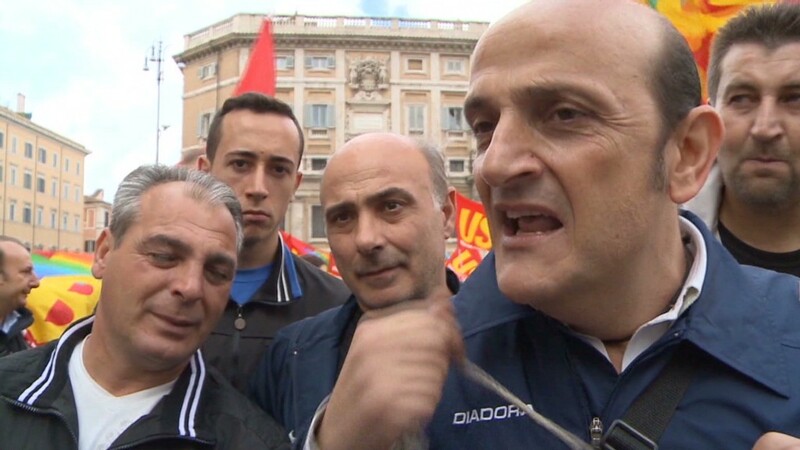 Berlusconi said late Monday that he's ready to advocate for a stronger union. 'I've always been a convinced Europe believer and I've always fought for a less bureaucratic Europe and a stronger political union, a common monetary union, and a common foreign policy, with a common defence policy, and there fore for a Europe that carries a heavier weight on the international field," he said in a press communique that appeared in Italian daily La Republica.